La Croix Rouge is a busy café in Dorie’s Paris neighborhood. Here, people who work in the nearby boutiques order open-faced sandwiches, tartines, that they eat a la Francais with knife and fork. With this week’s recipe for French Fridays with Dorie, two simple versions of tartines from La Croix Rouge’s menu are offered. Dorie suggests slicing the tartines into strips and serving as an appetizer. Svelte Parisian fashionistas would probably choose one version. I made one of each, picked them up whole, and ate them out of hand for lunch. Both were delicious. This recipe starts with bread, toasted on one side. I’m still obsessively baking no-knead bread a couple times a week, so homemade bread was the base for my tartines. For Version #1, Tartine Norvegienne, the toast is spread with butter, then topped with slices of smoked salmon and sprinkled with capers and a squirt of lemon juice. Yum! Even better is Version #2, Tartine Saint-Germain, where the toast is spread with mayonnaise, sprinkled with sliced cornichons and topped with roast beef. I love a good roast beef sandwich, with horseradish sauce or Boursin cheese. The tartine was a different flavor profile with the tart pickles, and the bed of toast gave it different texture than a softer sandwich. I stuck to the recipe’s suggested ingredients, but I suspect my fellow Doristas weren’t so obedient. I can’t wait to see the riffs they came up with. You can see their posts here. Tartines have earned a new spot in my lunch rotation. You don’t really need a recipe for these, but if you want it, you can find it in Dorie Greenspan’s book Around My French Table. Posted on 7 March 2014, in French Fridays with Dorie and tagged French Fridays with Dorie, roast beef, salmon, sandwiches. Bookmark the permalink. 18 Comments. I love our forays into tartine territory. I’m looking forward to strawberry season so I can revisit that one. I think yours make a very nice lunch and I bet many Parisiennes would have chosen one of each, as you did. This Dorista was mostly obedient this week. I skipped the cappers, but otherwise stuck with the recipes. 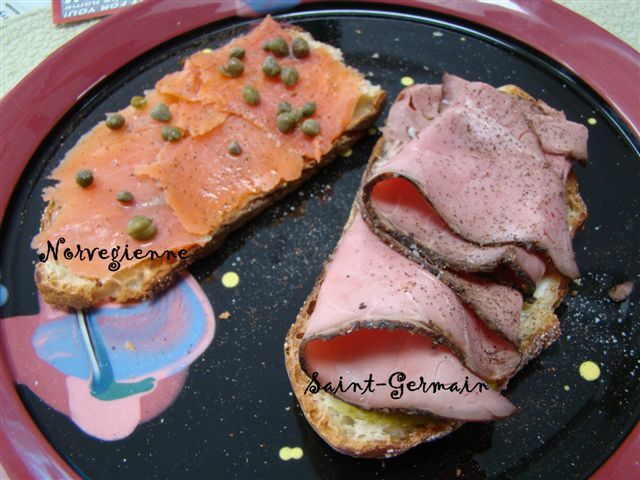 I prefer the Saint Germain too :) I am a huge fan of tartines! Yup, I ate mine whole…and it disappeared rather quickly. Love them both! I liked both, but the capers really hit the spot on the Norweigan tartine. I got all the ingredients in one trip and made them separately; for dinner and lunch! I made both as we and ate them for breakfast. Yum! Of course we weren’t obedient. I pulled an Emeril on mine and kicked the roast beef up a notch with horseradish sauce… the other version was tasty, but too tame. LOL. Loved everything about these little sandwiches and will do a repeat for sure. I made them again for lunch today…Bill really enjoyed them both! I ate mine the American way…by hand…picking it up and chomping away! I was also obedient this week! Glad you enjoyed this one, Betsy! Happy Weekend! I thought these were great too. I was planning on homemade bread, but alas, there was that really nice sourdough loaf just waiting there. So no. But we enjoyed these for a simple lunch! I loved these too, a very satisfying meal! Wow, homemade bread a few times a week. I’m impressed, and jealous! I added the instructions for the no knead rye bread that I make to the end of my post. I hope you like it! Lovely job on the tartines. They both look delicious. I forgot that you made your own bread. There is nothing better than warm bread just out of the oven. And, the aroma. I suspect it was pretty darn tasty with the tartines also. Why don’t we make “sandwiches” like this more often. So easy. So filling. I just don’t think of it. Sigh. Sigh. I really enjoyed the simplicity and flavors of this one.